NASHVILLE, Tenn. (CNS) — A wave of demographic change is sweeping through the Catholic Church in the United States. According to projections, in 20 years, half of American Catholics will be Hispanic. The Diocese of Nashville, like many dioceses, is already seeing this wave rolling toward middle Tennessee. One recent study found that 34 percent of the Catholics in the diocese self-identify as Hispanic, said Sister Mary Johanna Mellody, a member of the Dominican Sisters of St. Cecilia Congregation in Nashville whose assignment is to work in Hispanic ministry. “It’s the future of our church,” Sister Mary Johanna said of the growing Hispanic population. While the number of Latino families in the diocese and the country is growing, the number of Hispanic students enrolled in Catholic schools hasn’t kept pace. Of the 14.6 million school-age children in the United States, 8 million are Hispanic, Sister Mary Johanna said. Of those 8 million, 93 percent were born in the United States and are American citizens, she added. But only 400,000 Latino students are enrolled in Catholic schools, she told the Tennessee Register, Nashville’s diocesan newspaper. And that poses a big problem. “We’re totally losing them,” Sister Mary Johanna said of the younger generation of Latinos who are drifting away from the Catholic faith of their families. All of the schools in the Diocese of Nashville are trying to reach out to more Hispanic families, said Therese Williams, superintendent of schools for the diocese. And several have had some success, including St. Henry, St. Edward, St. Ann and St. Cecilia Academy. “The more diverse the school is, the more real world experience it is for our students,” Williams said. But there are several barriers to increasing Latino enrollment, both cultural and financial. Schools have little choice but to try to find ways around those barriers, said Dominican Sister Anne Catherine Burleigh, principal of St. Cecilia, an all-girls school. This year, St. Cecilia has 21 students who are Hispanic, including 11 in the freshman class. That’s about 8 percent of the total enrollment of about 270 students. 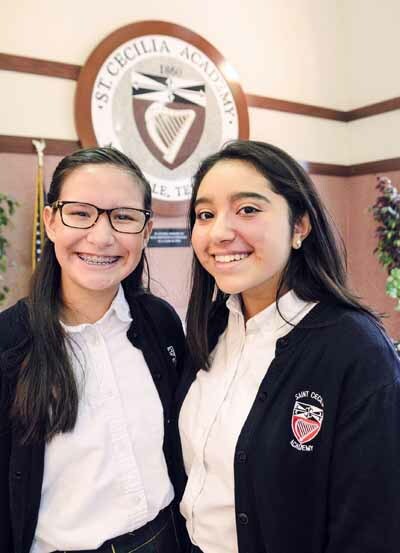 It’s how Leonel and Julia Santos of St. Rose of Lima Church in Murfreesboro found a Catholic school for their daughter, Valeria, a graduate of St. Rose School and a freshman at St. Cecilia. The Santos family is from Mexico and moved to middle Tennessee for Leonel Santos’ job as an electrical engineer. Although Leonel Santos attended public schools in Mexico from kindergarten through college, his wife, Julia, attended Catholic schools. When they arrived in Tennessee, they were looking for a Catholic school for their daughter. Marvin and Claudia Andrade both attended Catholic schools in their native El Salvador. And when they moved to Nashville, they were looking for a Catholic school for their daughter, Grecia, a junior at St. Cecilia who attended St. Edward School from fourth through eighth grade. The Andrades wanted their only child in a Catholic school because “we want her to live her faith,” Claudia Andrade said. When they came to St. Cecilia for an interview the first time, they saw that Mass was offered every day and the day started and ended with prayer, she said. The family found that appealing as well as the school’s high academic standards, discipline and the foundation it can provide for college, she said. Part of that is helping Hispanic families cross the language barrier. It’s important for the schools to have people on staff who can act as translators and to help the families navigate a Catholic school culture they might not be familiar with, Sister Mary Johanna said. In some cases, families need more practical advice, Sister Anne Catherine said, such as how to fill out the application, how to apply for financial aid, where to get uniforms, how to navigate the American college application process, how to get involved in the school. At St. Cecilia, the school hosts a Family Night for the families of all new students, including the Hispanic families. But the school also held a second Family Night just for the Hispanic families that was conducted in Spanish, Sister Anne Catherine said. Grecia Andrade and Valeria Santos and their parents all agreed that the school has made them feel welcome. As the former principal of St. Pius X School in Nashville, Sister Mary Johanna understands the budget pressures and limited financial resources that school leaders face. “It’s not that schools don’t want to do this. They just have limited resources,” she said. St. Cecilia already has endowed scholarships for particular groups of students, such as those with an interest in the arts or those who come from large families, Sister Anne Catherine said. She would like to establish a similar endowed scholarship for Hispanic students. “I know there are people out there with a heart for this ministry,” she said of potential donors.